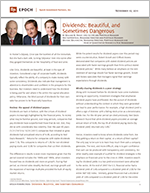 Dividends: Beautiful, and Sometimes Dangerous - Epoch Investment Partners, Inc. In Homer’s Odyssey, Circe was the loveliest of all the immortals. But she had a dark side, turning Odysseus’ men into swine after they gorged themselves on her hospitality of food and wine. Like Circe, dividends are beautiful, at least in the eyes of investors. Considered a sign of corporate health, dividends typically reflect the ability of a company to make money with some consistency. Dividends also indicate that management is attentive to shareholders and confident in the prospects for the business. But investors need to understand how the dividend is being paid for and where it fits within the capital allocation policy. Otherwise, the blind pursuit of dividends for their own sake has proven to be financially hazardous. Dividends are back in fashion, with the virtues of dividend payers increasingly highlighted by the financial press. To review what may be familiar ground, over long periods, companies that pay dividends have outperformed those that do not. And, they did so with considerably less volatility. Over the past 40 years (1/31/1972 to 10/31/2011) companies that initiated or grew dividends had annualized returns of 9.4%, according to Ned Davis Research.1 Returns for companies with stable dividends were 7.1%. This compares to returns of 1.5% for non-dividend-paying stocks and -0.9% for companies that cut their dividends. The difference in results is even more impressive given that the period covered includes the 1980s and 1990s, when investors focused less on dividends and more on growth. During that period, as interest rates steadily declined, earnings growth and the expansion of earnings multiples provided the bulk of equity market returns. Hence, investors need to know where dividends come from. Are they getting a return on their capital, or a return of their capital? The only way to be sure is to learn how much free cash a company generates. The next, and more difficult, step is to gain confidence that cash can be produced with transparency and consistency. Another readily seen example of a pitfall for dividend strategies is the emphasis on financials prior to the crisis in 2008. Investors searching for dividend yields in a low-yield environment were attracted to the sector. At the end of 2007 the U.S. financial sector had a dividend yield of 3.4% compared to a dividend yield of 2.0% for the entire S&P 500 Index. Similarly, global financials had a dividend yield of 3.6% compared to a dividend yield of 2.4% for the entire MSCI World Index.3 These yields were a Circean poison, intoxicating equity investors and causing them to overlook the lack of transparency in how cash was generated. Investors also need to consider if a dividend is the best use of cash. Effective CEOs and CFOs weigh the benefits of returning cash to shareholders against internal reinvestments and potential acquisitions as part of a capital allocation strategy. If projected returns for reinvestment or acquisitions exceed the firm’s cost of capital, then they should make those investments. If they do not, then excess free cash flow should be returned to shareholders. When returning cash is appropriate, dividends, share buybacks and debt repayments all add value, but more or less so at different points in the economic cycle. Wolfe Trahan & Co. recently studied the effectiveness of various uses of cash during early and late phases of economic expansion and contraction.4 They found that firms raising dividends the most were rewarded only in the late-contraction part of the cycle, when economic conditions were at their harshest. Investors tended to overlook dividends under other business conditions, with pronounced underperformance in the late-expansion phase. Source: Wolfe Trahan & Co.
Wolfe Trahan found that companies that repurchased their own shares tended to outperform over the following 12 months with a high degree of consistency while companies issuing shares were punished. Share buybacks were most effective during the late-contraction phase. Buybacks led to underperformance, however, when companies bought near peak prices in the early-contraction phase. A different picture emerges when dividends, share buybacks and debt repayments — what we call shareholder yield — are viewed collectively. While each has added more or less value during different phases of the cycle, together they have added value consistently across most of the cycle. The only exception was during the early stage of economic expansion. This makes intuitive sense because highly leveraged, low-quality stocks often rebound the most after a market bottom. We think focusing exclusively on dividends misses the point. We advocate a more holistic look at a company’s cash flow and its capital allocation policy. Only fundamental research can shed light on how a company generates cash. Investors need to understand the sources of a company’s long-term value creation and how those sources are being nurtured. Identifying companies with straightforward financial statements, a commitment to transparency and an ability to consistently grow free cash flow should be the starting point in building a portfolio that emphasizes yield. The next step is figuring out which companies will make wise use of their cash. Cash is king, as the saying goes. It is a bright spot on any balance sheet and a buffer against hard times. But raising cash can be a bearish sign. It might signal that company management anticipates a deteriorating environment and has decided to get defensive. It could also indicate that management sees no opportunities for growth. To sum it up, there are only five possible uses of corporate cash: reinvestment, acquisitions, dividends, share repurchases and debt pay downs. Reinvestments and acquisitions should be pursued if the firm expects a return higher than its cost of capital. Otherwise, the best use of cash is to provide shareholder yield. All three forms of shareholder yield — dividends, share buybacks and debt repayments — are effective forms of returning wealth to shareholders. Each adds more or less value at different points in an economic cycle. Adopting a broad view by taking all three into consideration can be more rewarding than only focusing on one. Companies that provide shareholder yield, as a result of growing free cash flow and intelligent capital allocation, should outperform over most of the economic cycle. Getting back to our story from the Odyssey, moly is a magic herb in Greek mythology that counteracts venoms and poisons. On the advice of Hermes, Odysseus used moly to protect himself from Circe’s evil magic. Understanding how a company generates cash and scrutinizing its capital allocation policy is moly for investors. So, if you don’t want to be turned into a pig . . .
2. Robert Arnott and Clifford Asness, “Surprise Higher Dividends = Higher Earnings Growth,” Financial Analysts Journal, January/February 2003.